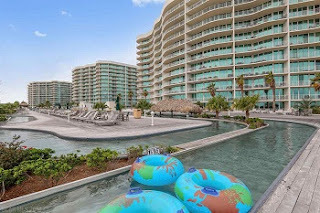 Caribe Resort waterfront condominium for sale in Orange Beach AL. Check out the view in this 1400 sq. ft. - 2 bedroom, 2 bath condo at Caribe Resort. Beautiful new plank tile in the bedrooms and top of the line furniture on the balcony. Stainless appliances and granite throughout make this unit a great buy! Caribe communities amenities include a lazy river, multiple indoor & outdoor pools, state of the art exercise facility, putting green, tennis courts, sauna, BBQ grills, and more – don’t miss viewing this one!.